I don't consider unboxing videos to be a particularly exciting form of entertainment, but at least they give you an idea what to expect when you bring a gadget home. Well, not all of them fit this mold. 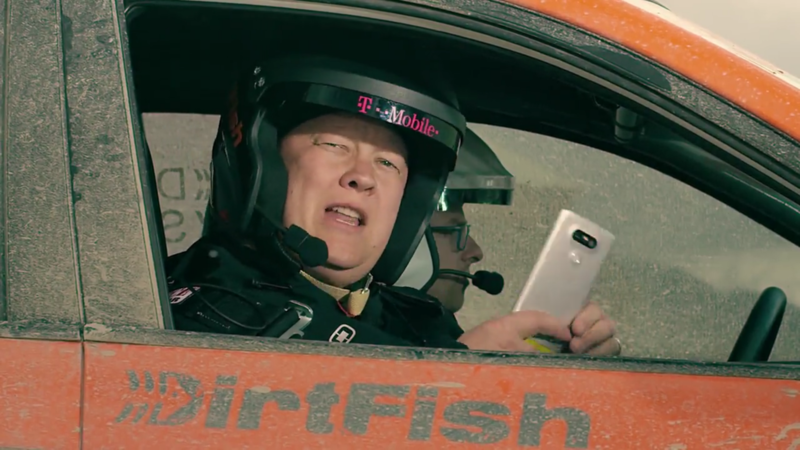 T-Mobile's latest video shows employee Des unboxing the LG G5 in the passenger seat of a rally car. There isn't much point to being in a car. Unlike with T-Mobile's underwater unboxing video showing off the Galaxy S7's IP68 rating, the G5 isn't particularly good at being jostled around or standing up to absord amounts of dirt. But it does give Des something to hold while he goes on a presumably free (for him) ride on a race track. The contents of the box go by too quickly to get a good look. Fortunately Des reads them out loud, and they're what you would expect: a SIM card, quick start guide, USB Type C charger, and a wall charger. The video does provide a look at some of the accessories that take advantage of the phone's magic slot, such as a replaceable battery and the CAM Plus camera attachment. Then there are others that connect via Bluetooth or the USB port, such as the 360 CAM and the 360 VR headset. The G5 is set to go on sale early next month.